Yours FREE with every order over €100 during Valentines Week. Offer ends Friday Feb 17th! 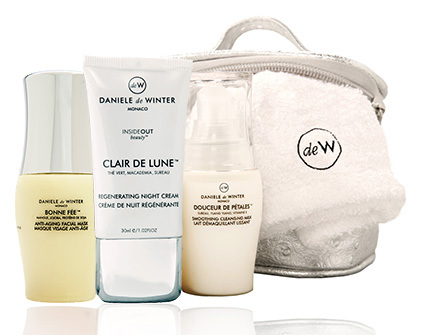 The Nourishing SMOOTH BEAUTY Travel Kit is ideal for hydrating and perfecting dry or tired skin after a long day in an airconditioned office, in the sun or while traveling. DOUCEURS DE PETALES™ creamy cleanser with Elderflower and Vitamin E effectively removes even thick makeup and grime while leaving skin silky soft. BONNE FEE™ - Firming, Smoothing leave-in Jojoba Mask works like a magic wand to brighten and unify your complexion in just 10 minutes. Also suitable as a primer, BONNE FEE can be applied directly over CLAIR DE LUNE and left to absorb for ten minutes, then apply makeup directly on top. Look 10 years younger in as many minutes! Apply in 3 steps after a busy day or before a big night. Elderflower, Vitamin E, Coconut, Aloe Vera, Jojoba, Soy protein, Matcha Green Tea, Macademia oil. FREE FROM SLS - FREE FROM PARABENS.